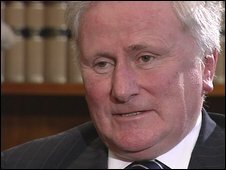 Sir Brian Kerr, who took his seat in the House of Lords on Monday, will be the last Law Lord to be appointed. Lord Kerr of Tonaghmore, who is standing down as the Lord Chief Justice of Northern Ireland, replaces the retiring Lord Carswell as a Law Lord. From October, the Law Lords will become Justices of the new Supreme Court. It will take over the judicial functions of the House of Lords. The 61-year-old was called to the Bar in Northern Ireland in 1970, to the Bar of England and Wales in 1974 and became a QC in 1983. He was appointed a High Court Judge in Northern Ireland in 1993, the same year he was knighted, and in 2004 he was appointed Lord Chief Justice of Northern Ireland.